There’s nothing quite like a root beer float. Is it a drink? Is it a dessert? Is it refreshing? Is it decadent? Perhaps it is all of these. Slightly spicy root beer and smooth, rich vanilla ice cream complement each other perfectly and – more than that – the recipe to make a root beer float is easier than your slutty freshman year roommate. Really. Note: Your ice cream may cause the root beer froth to overrun the glass. This is the perfect time to scandalously ask the cute co-ed near you if s/he would like to lick your glass. 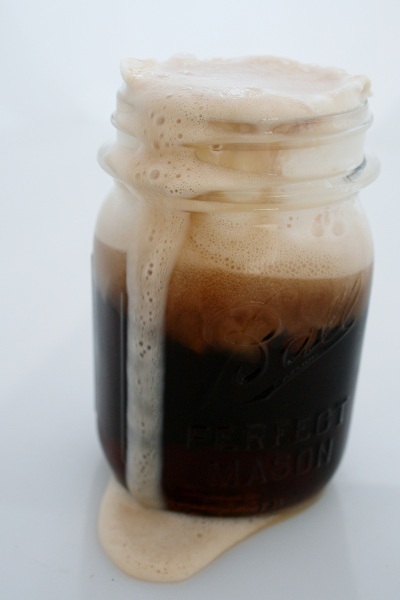 Pour your root beer into the glass, leaving enough room in the glass for your scoop of ice cream and subsequent froth. Put the scoop of ice cream into the glass. Stir gently with the spoon. Slurp with straw and eat with spoon, alternately.